I am selling one of the RAREST Audi Cars Available. Not one for sale in the USA this year. 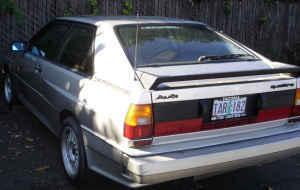 Audi only shipped 73 to the US in 1985 as the car cost $49,000 to buy. This one was shipped over here in 1992 from Germany. Has the Euro Chip with over 200BHP. Nardi wood steering wheel and shift knob. Fiberglass deck lid was new for this year as well as newer wiring and updated leather interior. This is the only one in the USA like this one. ZERMATT SILVER Paint. Perfect interior and dashboard and Carpet. No rips in anything. New Sunroof Seal. New 215/50/15 v rated tires. Has original Rally Ronals. NO Dents. No wrecks. THESE CARS WERE HAND MADE IN GERMANY!!!! YOU cannot find these cars. If you do they wont sell them. I hate to sell this one!!! Just had timing belt, fuel injectors, water pump, Fuel Filter done. Perfect compression. New Ansa Muffler and powder coated cam cover and timing belt cover and pulley. An Absolute Gem. This is the nicest one I have seen and this is the rarest year for this car and the rarest Color. Not even sure they shipped Zermatt Silver as a color in 1985, only in germany. paint is extremely nice for original paint. there are some scratches and the front and rear bumpers need a new paint job. Do not waste my time. ONLY SERIOUS buyers!! This is a very valuable and rare car. The last one i saw sell was a 1983 for 20,000 nearly a year ago. No rust, door jams, everything is perfect. I have pictures of everything for really interested buyers. No low ballers. I hope this car is listed somewhere else with a better ad because this Craigslist posting hasn’t convinced me that this car is worth $20k! The pictures look like they were shot in tow truck parking lot, and most of the very lengthy description looks completely copy-and-paste from someone else’s listing! 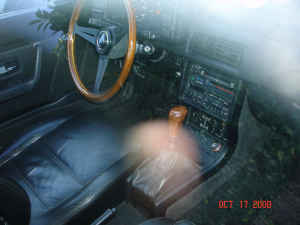 Not to mention, am I the only one who thinks the wooden steering wheel and shift knob are out of place? One thing the seller is right on about is the fact that these are rarely seen for sale. Hell, they practically make e30 M3‘s look abundant in comparison! Update: This post is out of date and the item listed is probably not available any more. Why not take a look at these Audi Coupes and parts that are currently for sale! 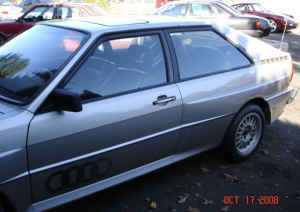 Tagged All Wheel Drive, Audi, Coupe, Quattro, Rare, silver, urQuattro.